You&apos;d think, after scoring 38 goals in 80 appearances for his home nation as a player, and then guiding Germany as a coach to a surprise third-place finish at the 2006 World Cup, Jürgen Klinsmann would be universally adored in the country of his birth. That he isn&apos;t is just one of many peculiarities surrounding the career of the man who will lead the U.S. team in its second-round game Tuesday against Belgium. In the period before that World Cup eight years ago, Klinsmann drew a lot of criticism for maintaining California as his permanent home. He would commute across the Atlantic when Germany had a game window to cast his eyes over players. 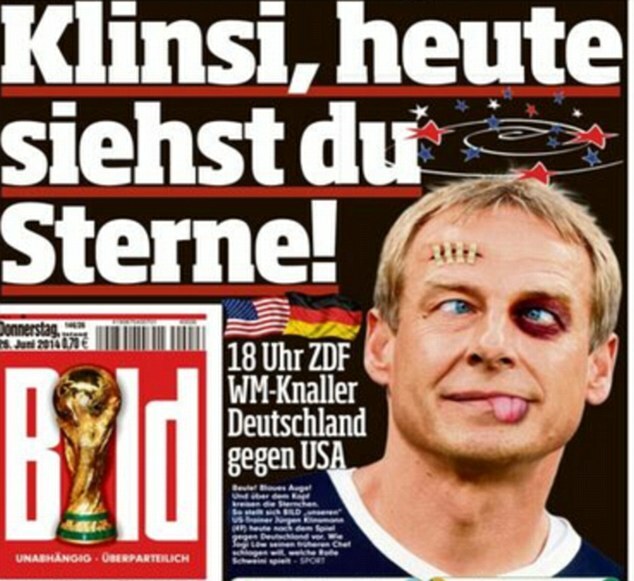 The German tabloid Bild — which portrayed Klinsmann beaten up and with a black eye before the United States’ group-stage matchup with the Germans last week — described the decision to maintain his Californian lifestyle as "insolent and outrageous." To Germans, he comes across as too different, as someone who has ideas and influences that are aloof and too foreign. During his short, failed tenure as the coach of Bayern Munich — comfortably Germany&apos;s biggest club — in the 2008-09 season, he brought Buddha statues into the training complex, which he turned into a building where players could take yoga classes, meditate, enroll in language classes and listen to lectures. On one hand this is sensible, progressive thinking in a sport where improving athletes off the field is still given scant regard. But it enforced an image in his homeland that there was something a little too foreign about Klinsmann. "Somehow, he was never quite German enough for Germany," Die Welt wrote last week. "Or Germany was never enough for Klinsmann." In contrast, he is adored in England, where he played in two short spells for Tottenham Hotspur in the 1990s and has continued to do TV work at major tournaments. Arriving in 1994 with a reputation as something of a diver, Klinsmann&apos;s self-deprecation, intelligence and goals (20 in his first season) helped him win the love of an entire country. In England, where soccer players aren&apos;t known for their conversational skills and outward expressions of intelligence in athletes are treated warily, Klinsmann was the urbane, intellectual German they could get along with. Americans haven&apos;t quite made their mind up as to which way they see Klinsmann. In his tenure as the national team coach, which began in 2011 when he took over from the fired Bob Bradley, soccer followers have seen him both ways: as the forward-thinker from a soccer nation who can finally turn the U.S. into regular contenders on the world stage, and as the fussy outsider with a messianic zeal to fix things that aren&apos;t necessarily broken. The case for the former lies in the team&apos;s performances so far in this World Cup: avenging the second-round defeat to Ghana four years ago, finishing one moment of Ronaldo genius from defeating Portugal and going down credibly to the Germans to escape one of the tournament&apos;s two "groups of death." Across the world, viewers have been impressed with the Americans&apos; organization, fitness and desire, as well as the team&apos;s ability to produce stunning moments like Jermaine Jones&apos; equalizer against Portugal. But some of his decisions, such as calling up five German/American dual nationals and leaving Landon Donovan — for so long the team&apos;s major talent and talisman — out of the World Cup squad have alienated some fans. Worse, last December, he told reporters that he didn&apos;t believe the U.S. could win the tournament, which perplexed many in a country used to being No. 1 in almost everything. If Klinsmann&apos;s team can get past Belgium, which is no easy task, any lingering doubts about him will be forgotten. A win sets up a likely quarterfinal against Argentina, which would be the biggest and most important soccer game in American history. If the Portugal matchup was a watershed for the sport in the U.S., taking on Lionel Messi and Co. with the world watching would give soccer unparalleled exposure in America. And that&apos;s a legacy Klinsmann would be happy with.